Summary: Researchers report playing action video games increases performance on visual selective activities. Players had increased focus on relevant visual information while suppressing less relevant information. Researchers have demonstrated that just one hour spent playing video games has an effect on the brain. 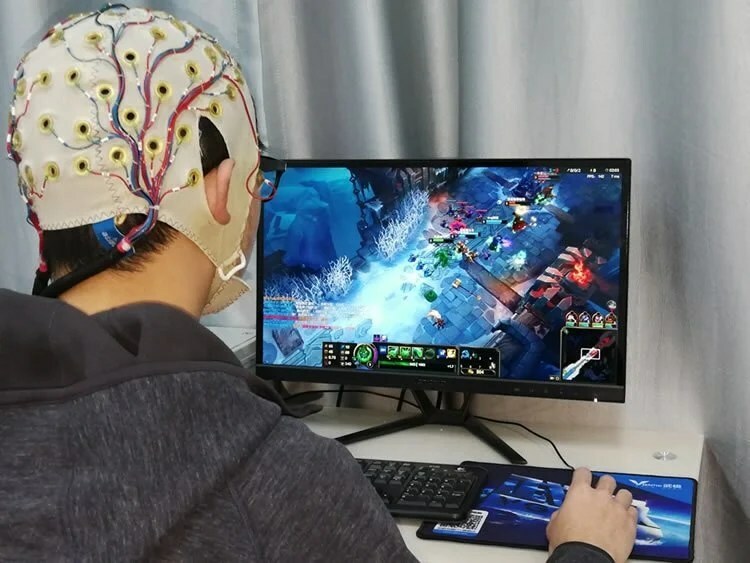 The research team found changes in brain activity and increased performance on tests of visual selective activity in subjects who had spent one hour playing the League of Legends video game. Their results are published in the journal Frontiers in Human Neuroscience. Weiyi Ma, assistant professor of human development and family sciences in the University of Arkansas School of Human Environmental Sciences, collaborated with researchers at the Key Laboratory for NeuroInformation of the Ministry of Education of China, one of the leading research centers for neuroscience in China. Dezhong Yao and Diankun Gong direct the Key Laborator and serve as co-authors of the article. Twenty-nine male students at the University of Electronic Science and Technology of China participated in the study. The students were identified as either experts, who had at least two years of experience playing action video games and were ranked in the top seven percent of League of Legends players, and non-experts, who had less than half a year of experience and were ranked in the lowest 11 percent of players. Before and after playing the video game, the participants’ visual selective attention was assessed. Visual selective attention refers to the brain’s ability to focus on relevant visual information while suppressing less relevant information. Processing information uses energy, so individuals who excel at visual selective attention—who can narrow their focus and block out distractions—are using their brains more efficiently. Students who spent one hour playing video games demonstrated improved visual selective attention and changes in brain activity. NeuroscienceNews.com image is credited to the researchers. To assess visual selective attention, the researchers briefly showed each subject a square in the center of a computer screen. Then another square flashed in a different part of the screen and the subject was asked to identify the position of the second square relative to the first. During the course of the experiment, the researchers also monitored brain activity associated with attention using electroencephalography, or EEG. The researchers observed that in the initial assessment, the expert gamers had more brain activity associated with attention than the non-experts. The experts also scored better on the initial visual selective attention assessment. After the hour long video game session, both the experts and non-experts had improved visual selective attention, and the two groups received similar scores on the post-game assessment. The non-experts also showed changes in brain activity, according to the EEG data. After the gaming session, their brain activity was similar to that of the experts. Original Research: Open access research in Frontiers in Human Neuroscience. University of Arkansas “One Hour of Video Gaming Can Increase the Brain’s Ability to Focus.” NeuroscienceNews. NeuroscienceNews, 17 February 2018. University of Arkansas “One Hour of Video Gaming Can Increase the Brain’s Ability to Focus.” http://neurosciencenews.com/focus-video-gaming-8513/ (accessed February 17, 2018). A central issue in cognitive science is understanding how learning induces cognitive and neural plasticity, which helps illuminate the biological basis of learning. Research in the past few decades showed that action video gaming (AVG) offered new, important perspectives on learning-related cognitive and neural plasticity. However, it is still unclear whether cognitive and neural plasticity is observable after a brief AVG session. Using behavioral and electrophysiological measures, this study examined the plasticity of visual selective attention (VSA) associated with a 1 h AVG session. Both AVG experts and non-experts participated in this study. Their VSA was assessed prior to and after the AVG session. Within-group comparisons on the participants’ performance before and after the AVG session showed improvements in response time in both groups and modulations of electrophysiological measures in the non-experts. Furthermore, between-group comparisons showed that the experts had superior VSA, relative to the non-experts, prior to the AVG session. These findings suggested an association between the plasticity of VSA and AVG. Most importantly, this study showed that the plasticity of VSA was observable after even a 1 h AVG session. Yes I could be possible! As human study, where is trial registry number? To state any hypothesis sample size should be between 100 and 200! Less sample size gives type 1 error! That is reason behind positive outcomes!